In this emotionally charged and riveting novel from the author of One September Morning and In a Heartbeat, one woman is torn between loyalty to her family's ways and to her most profound convictions. . . The daughter of a career cop, Bernadette Sullivan grew up with blue uniforms hanging in the laundry room and cops laughing around the dinner table. Her brother joined New In this emotionally charged and riveting novel from the author of One September Morning and In a Heartbeat, one woman is torn between loyalty to her family's ways and to her most profound convictions. . . The daughter of a career cop, Bernadette Sullivan grew up with blue uniforms hanging in the laundry room and cops laughing around the dinner table. Her brother joined New York's finest, her sisters married cops, and Bernie is an assistant District Attorney. Collaring criminals, putting them away--it's what they do. And though lately Bernie feels a growing desire for a family of her own, she's never questioned her choices. Then a shooter targets a local coffee shop, and tragedy strikes the Sullivan family. Anger follows grief--and Bernie realizes that her father's idea of retribution is very different from her own. All her life, she's inhabited a clear-cut world of right and wrong, of morality and corruption. As Bernie struggles to protect the people she loves, she must also decide what it means to see justice served. And in her darkest hour, she will find out just what it means to be her father's daughter. To ask other readers questions about The Daughter She Used To Be, please sign up. The Daughter She Used To Be by Rosalind Noonan was a ♥♥♥ for me. The beginning was extremely slow and I almost gave up on; the reason why I didn't is because it fits some reading challenges for me. Bernadette Sullivan is the youngest in this family of police officers in NYC; her role is as an assistant district attorney in NYC. The first 100 pages really were awful to read: so many characters, many clichés, and some characters that were just unlikable. 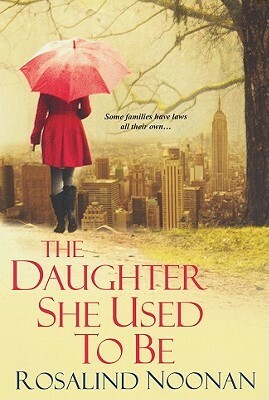 The storyline picks up after a major event The Daughter She Used To Be by Rosalind Noonan was a ♥♥♥ for me. The beginning was extremely slow and I almost gave up on; the reason why I didn't is because it fits some reading challenges for me. Bernadette Sullivan is the youngest in this family of police officers in NYC; her role is as an assistant district attorney in NYC. The first 100 pages really were awful to read: so many characters, many clichés, and some characters that were just unlikable. The storyline picks up after a major event at Sully's Cup and from then on, I just wanted to find out what happened to everyone. The winds of change are blowing for the Sullivans. This tight knit family of God loving and fearing cops will be strained to the very fibers of their souls. A terrible crime will rock the very foundation of all they hold near and dear. As every member faces a new and stressful day they will all handle the situation differently and some of the effects will damage an already volatile situation. Sully the patriarch has vowed to keep his family safe and when he knows that isn’t always possible, some The winds of change are blowing for the Sullivans. This tight knit family of God loving and fearing cops will be strained to the very fibers of their souls. A terrible crime will rock the very foundation of all they hold near and dear. As every member faces a new and stressful day they will all handle the situation differently and some of the effects will damage an already volatile situation. Sully the patriarch has vowed to keep his family safe and when he knows that isn’t always possible, something inside him breaks. Bernie the baby of the family has turned to law to fit into this brood of blue brothers, but her beliefs will put stress on a family already falling apart. She and Sully will but heads continually but it doesn’t mean she loves him any less but for Sully the actions of Bernie make her in no uncertain terms “ The Daughter She Used To Be”. What will happen to this once golden group, will they ever recover from what happened or will they ever be changed by fate. What will happen to their once solid faith and who will suffer the most from the fallout. Rosalind Noonan has given us very realistic look at the things that “could happen” and do, the things that tear the closest of families and friends apart, she does this with an incredible eye for detail and emotion as she spins this tale that we could read on any front page or news website. She does this with dialogue that will take her readers to the Burroughs of New York thick with diversity and flavor and deliver something very special to those of us lucky enough to read the novel. Her characters are the real stars here and she has an amazing way to intimate her audience to each and every one, no matter the role they play, no matter the depth of their involvement. She gives us a realistic look at a family drama come to life and how this one family survives the bomb blast that they will be given. If you like family drama, crime fiction or even romantic suspense you will like this novel as Rosalind Noonan expertly mixes a bone chilling thriller with a family drama and throws us a small bone of a love story to boot. My first experience with a Rosalind Noonan, but as they came highly recommended from my mom, I would have to agree with her that this won't be my last Rosalind Noonan read. As luck would have it, I was asked to host this book for a book tour and what a great read. I am now in a relationship with a police officer, so this book hit way close to home, but this new living situation, may have helped me love it even more. The story centers around the youngest daughter of a retired police officer who s My first experience with a Rosalind Noonan, but as they came highly recommended from my mom, I would have to agree with her that this won't be my last Rosalind Noonan read. As luck would have it, I was asked to host this book for a book tour and what a great read. I am now in a relationship with a police officer, so this book hit way close to home, but this new living situation, may have helped me love it even more. The story centers around the youngest daughter of a retired police officer who spent 50 years serving the city of New York and lived through many things including 9/11. Along with this main story is another story that centers around a young man who has some physical disabilities and is just getting out of prison, the way these stories intertwine is entertaining and heartbreaking. Nothing about this stuck with me, it felt like an NBC pilot. Not bad, had some different perspectives but the characters were too superficial or cliche for me to be really interested in their stories. Ok to pass the time. Pretty good story of stereotypical Irish, Catholic NYC cops. Has an interesting twist, though. This book is entertaining. The pace of the plot is slow at times, but it kept my attention. Bernadette Sullivan is one of two daughters in the Sullivan family. All of her brothers (4?) and her father, are NYC cops. Their lives seem so exciting and she is fascinated by their stories. She is an attorney with a desk job. She is wanting to settle down with a man she works with, but her family scorns him because he is not Italian. She just feels out of sync with her wants/needs and her life. Then tra This book is entertaining. The pace of the plot is slow at times, but it kept my attention. Bernadette Sullivan is one of two daughters in the Sullivan family. All of her brothers (4?) and her father, are NYC cops. Their lives seem so exciting and she is fascinated by their stories. Then tragedy strikes her family. Her father's coffee shop that caters to cops is robbed. Her brother is killed and a good friend is seriously injured. She has a part time job to investigate insurance claims and even that takes a crazy turn. She is accused of helping the claimant to make a fraudulent claim. Found this one a bit more difficult to get in to. Didn't enjoy it as much as the others I have read. I was completely blown away from this amazing story by Rosalind Noonan. She captivated me from the beginning and kept me enthralled throughout the whole novel. I kept wanting to peek ahead to see what would happen next. This is storytelling at its very best!! You would think that this story revolves around the daughter Bernadette “Bernie” Sullivan. In reality, I feel it revolves around every single member of the Sullivan family and even a few of the extended cast. Yes, Bernie held the limelight a I was completely blown away from this amazing story by Rosalind Noonan. She captivated me from the beginning and kept me enthralled throughout the whole novel. I kept wanting to peek ahead to see what would happen next. This is storytelling at its very best!! You would think that this story revolves around the daughter Bernadette “Bernie” Sullivan. In reality, I feel it revolves around every single member of the Sullivan family and even a few of the extended cast. Yes, Bernie held the limelight a bit more and it was her driving desire for honorable justice that propelled the storyline, but it was the whole cast of characters that made this story as strong as it is. The Sullivan’s are a family of crime fighters. Either you are a cop, married to a cop or involved in the law. This is all they know. When tragedy hits close to home, their views and family ties are tested. Can this Irish Catholic family survive? The book is separated into three parts; the buildup, the aftermath, and then finally the consequences. With each chapter I could feel the suspense growing. I could almost feel it in the air while I was reading. I had the expectation that something big was going to crash down on me and then I was still totally taken by surprise when it did. I was absolutely floored and my heart was broken. During the aftermath I was still reeling from the tragedy and desperately trying to grasp and cope with my feelings. I felt all the emotions that every single character was feeling. Ms. Noonan did a superb job with her writing skills to make me feel my emotions so overwhelmingly. The consequences were just as well written. Depending on how you felt about the issues that were being written about, I can see every reader feeling differently about this part of the story. There are a few highly controversial ideas and views brought up. I enjoyed how they were written, without feeling preachy. It’s been a long time since I have had so many emotions ripped out of me; so many highs and so many lows. This was a journey of the soul. A deep look into oneself to discover what you are really made of. I highly recommend this book. While it is an emotional read it is extremely thought provoking and very well written. Be prepared for the emotional roller coaster. I laughed, wept, and even got angry. Along the way I learned a few things about myself and I’m a better person for it. This is an outstanding story! Ms. Noonan has truly woven a spellbinding tale of family loyalty, suspense, and romance. We follow Bernadette (named for St. Bernadette) “Bernie” Sullivan, youngest daughter of legendary/retired police officer James “Sully” Sullivan, who is the Patriarch of this strong Irish/Catholic family of five, with two sons who are also members of the NYPD and Bernie joining the ranks as Assistant District Attorney. You will be introduced to Peg, Sully’s strong-willed “Better-Half” as well as Matriarch of the Sullivan Clan, Sully’s befuddled Mother, Mary; who may bring out a chuckle and remind you of a loved one, “Brothers in Blue”, James and Brendan , their wives and children, and Bernie’s Sisters, “Devoted but the Woman Scorned” Mary Kate, and the “ black sheep of the family”, Lucy. You will definitely grit your teeth and boo/hiss Bernie’s arrogant, over-bearing Brother-in-Law, Tony Marino. When Peyton Curtis; a newly-released inmate from Lakeview Shock Prison, marches into Sully’s coffee shop, “Sully’s Cup” and opens fire on who he believes is responsible for the injustices he has endured, tragedy strikes the Sullivan family. A mixture of anger and grief tinged with revenge rears its ugly head. As much as Bernie loves her family, she decides, for better or worse, that she must follow her own conscience and pursue what she believes as just and right. But, what effect could her decisions have on her relationship with her beloved confidante, sounding board, and lover “Keesh”? She knew she had found her soul mate back in their college days and prayed that nothing would ever make them drift apart. Prior to the shooting, their parents’ opinions had been making any hope of a future together an impossibility. To complicate matters further, Bernie is being reminded that her biological clock is ticking every time she turns around. Ms. Noonan tackles difficult topics such as capital punishment, abortion and infidelity with tact and grace. This is the second book within a few months that has brought me to tears. The emotions that erupt in these pages will keep you wanting more, more, more! I, for one, am hoping that it won’t be long before we have another of Ms. Noonan’s volumes to enjoy. In the interim, Don’t miss this one!! As I started reading, I was reminded of Every Last One by Anna Quindlen. We start with seeing Bernie and her family’s day-to-day life before – BAM! – tragedy strikes. Unlike Quindlen’s book, I wasn’t blindsided by the violence in this one – it’s told pretty clearly in every synopsis I’ve found. Still, it is highly emotional and packs quite the punch. And the aftermath is no less emotional. Watching Bernie evolve from the daughter she used to be to the woman she was meant to be is fulfilling. She As I started reading, I was reminded of Every Last One by Anna Quindlen. We start with seeing Bernie and her family’s day-to-day life before – BAM! – tragedy strikes. Unlike Quindlen’s book, I wasn’t blindsided by the violence in this one – it’s told pretty clearly in every synopsis I’ve found. Still, it is highly emotional and packs quite the punch. And the aftermath is no less emotional. Watching Bernie evolve from the daughter she used to be to the woman she was meant to be is fulfilling. She is worried about the repercussions to letting her father down, but doesn’t let that sway her from doing what she feels is right. Always told in third-person, we get varying points of view. We see Sarah, Mary Kate, and Sully’s perspective, but it’s clear that Bernie is the primary focus. I found that many things were a bit predictable, but there were many unforeseen (at least by me) events. The conclusion is quite dramatic, but not over-the-top. And the epilogue is perfect. This book grabbed my attention, mostly, because my own family is a cop family. Both of my brothers are officers, my cousin is dating an officer, and my dad retired from the force a few years back. In many ways, I found myself in Bernie. Although I am a staunch supporter of the death penalty, I admire her ability to find her own beliefs in a family that disagrees with her beliefs. I don't believe that my dad would react like Sully did and disown me, either. But I can definitely understand where Su This book grabbed my attention, mostly, because my own family is a cop family. Both of my brothers are officers, my cousin is dating an officer, and my dad retired from the force a few years back. In many ways, I found myself in Bernie. Although I am a staunch supporter of the death penalty, I admire her ability to find her own beliefs in a family that disagrees with her beliefs. I don't believe that my dad would react like Sully did and disown me, either. But I can definitely understand where Sully was coming from, as well. All of my growing up years, the most interesting dinner table discussions involved stories of my dad's job. I had no idea that most people did not grow up in an idyllic environment like the one I was raised in. Bernadette "Bernie" Sullivan comes from a family of blue bloods. Her fascination of police stories told during family dinners draws her into law but not enough to become a police officer. She believes in justice and wants to help people, but at what cost. When a family tragedy strikes the Sullivan clan, each member has their own way of handling their grief. Some seek retribution while others try to make sense of it all. Bernie wants to do the right thing, but the loyalty to her family is tested. F Bernadette "Bernie" Sullivan comes from a family of blue bloods. Her fascination of police stories told during family dinners draws her into law but not enough to become a police officer. She believes in justice and wants to help people, but at what cost. This book is powerful and moving, and contains many viewpoints. There was never a dull moment in this book and I had to control myself more than once from breaking down in tears. This book has it all except comedy; action, drama, romance, and tragedy. It was thought provoking and much more than what I expected to get out of this book. I didn't see many things coming at all, and they made the story more the better for it. It's my first book by Rosalind Noonan, but it won't be my last. This book is an amazing read! Rosalind Noonan is a wonderful author. This is my second book I have read of hers and both are wonderful! I have another one sitting on my shelf and I can't wait to dive right in to that one. I think I would read anything she writes. I could not put this book down. From the very start I was captivated. I just wanted to turn one more page, one more page, until the very end. Then I didn't want the story to end! The author has a gift for storytelling. I really felt emotionally connected to the characters and the struggles they were going through. The story of Bernie (DA), her family of cops, and a recently released convict and how their lives intertwine was very captivating and exciting. I couldn't put the book down because I wanted to find out how the story ended. This was an engrossing novel of an assistant DA and her family of NYPD cops. While she fights crime from the courtroom, her father, brothers and brother-in-law fight from the streets. When a terrible tragedy happens, her family deals with it in different ways. This was a very suspenseful read from an author I've enjoyed in the past. A very gripping and well-written tale about family dynamics and how quickly they (as well as individuals)can change the moment tragedy strikes. I found myself very sad throughout most of this book as it focused on the heartache of others, but I would definitely read another book by this author. Bernie is an Asst. DA, her father was a career cop, her brother a cop and her sisters married cops. When tragedy strikes all in the family reexamine their lives and their idea of justice. Good thought provoking character driven story. Would have rated it 3.5 if I could. This was a very moving story with lots of drama and family warmth. This author does a great job of making the characters feel real. The epilogue wrapped everything up a little too neatly, but otherwise it was a very compelling read. Held my attention and didn't have any slow parts. If you are part of a cop family or know one, you can relate to this book. Excellent read. It really gives a great insight into how all families are affected by the good guys vs the bad. Excellent story! The protagonist grew up in a family of cops. Her brother and two other cops were killed in a shooting. She ends up working for the defense because she (and her slain brother) are against the death penalty. Very well done, dealing with moral issues in a very real way. Another great story from Rosalind Noonan! This is the second book I have read by this author, and I really liked both of them. You will be hooked right from the beginning. If you like police and family stories, I highly recommend you read this story. This is a "new" author for me. Enjoyable. Will definitely search for more books by this author. She caught the writing bug in second grade when she won first place in a poetry contest. "The prize was twenty dollars," she recalls. "That w ROSALIND NOONAN grew up in suburban Maryland and enjoyed being part of a large family. "With my four siblings, Saturday mornings were a blast," she says. "There was festival seating on the living room floor as we devoured cartoons and passed the Sugar Pops."